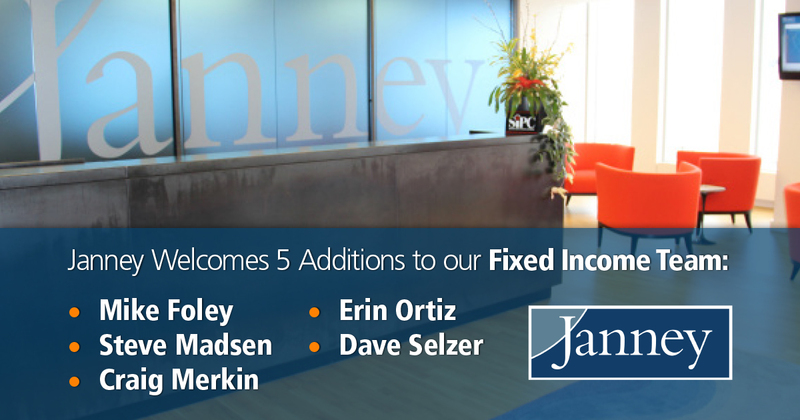 PHILADELPHIA, PA – July 6, 2017– Janney Montgomery Scott LLC (“Janney”), a leading full-service wealth management, financial services, and investment banking firm headquartered in Philadelphia, PA, announced today a promotion and the addition of five new employees in the organization’s Fixed Income Capital Markets Group. Matt Davis, a Managing Director, was promoted to Head of Municipal Trading and Underwriting at Janney’s headquarters in Philadelphia, PA. Mr. Davis will now oversee all of the organization’s municipal institutional traders and underwriters. Mike Foley joined the firm as Director in the Securitized Sales Group. Mr. Foley previously worked at INTL FC Stone/GX Clarke. He will be located in Janney’s New York City office. Craig Merkin and Dave Selzer both joined as Directors in Janney’s Institutional Sales Unit, and will be based in San Francisco, CA. Craig and David join Janney from Deutsche Bank Securities, where they were Fixed Income Generalists. They have been highly successful over the course of their careers and bring valuable cross-asset sales experience in taxable space to the Janney platform. Steve Madsen joined Janney as Managing Director, Institutional Credit Trading Group. Mr. Madsen has a wealth of experience trading credit at CIBC, Societe Generale and Deutsche Bank, in addition to running Barclay’s $1B Relative Value/Event Driven Fund. Steve has a BS in Electrical Engineering from Marquette University and an MBA from the Wharton School of Business. He will work out of the New York City office. Erin Ortiz joined Janney’s Taxable Fixed Income Group as Managing Director, Municipal Credit Analyst, and will serve as the Municipal Strategist in Philadelphia, PA. Ms. Ortiz was most recently with Moody’s Investors Service as a Bond Analyst for nearly eight years. In this role, she was a Lead Credit Analyst for higher education and not-for-profit issuers across the US, primarily in states along the eastern seaboard and in the Midwest.